There's not a bad seat in the house at Blue Wahoos Stadium! Click on the button below to find your favorite seat in the ballpark with the best view in baseball! 70 home games at Blue Wahoos Stadium means 70 unforgettable experiences in 2019! Don't miss a single promotion, giveaway, contest, fireworks show, or walk-off win! Save while seeing only the games you want during the 2019 season! Select from one of our pre-made plans or personalize a Mini Plan that lets you attend the games, giveaways, and promotions you choose! Bring your group out to beautiful Blue Wahoos Stadium! Whether you're entertaining clients, hosting employees, throwing a party, or just getting together with family and friends, let us provide you a special experience at the ballpark! 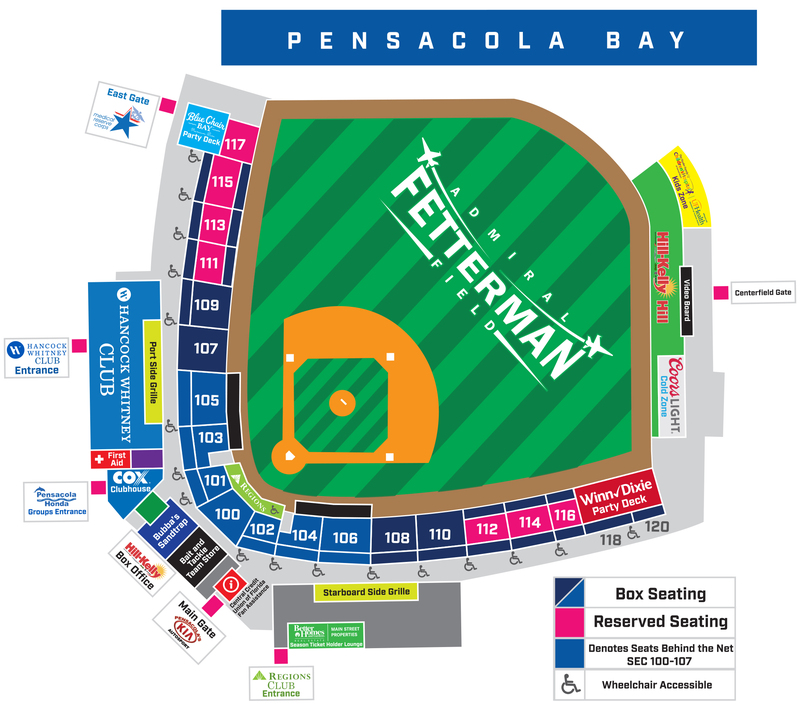 The Blue Wahoos are dedicated to making Pensacola the best place to live in the world and we'd like to help your non-profit! Check out ways that we can help your organization through our fundraiser ticket program. Entertain customers and employees or throw a bash for your team, organization, family, or friends in one of our Party Decks! Enjoy a ballgame, buffet dinner, Blue Wahoos cap, and other exclusive benefits for your group of 25 or more people! Let us throw you an unforgettable party for a birthday or team gathering! We'll supply a Blue Wahoos souvenir and ballpark meal to every child at your party, provide a visit from Kazoo, seating together for the game, a group photo, a videoboard shoutout, and more! Take the field with the Blue Wahoos for an unforgettable pre-game experience! Your youth group will be announced pre-game before taking the field side-by-side with your favorite Blue Wahoos stars during the National Anthem! Each participant will also get a ballpark meal! Help welcome the Blue Wahoos onto the field and high five each player in the starting lineup! Your group will be announced before the game, each participant will get a ballpark meal, and Kazoo will visit your group during the game! Every Tuesday throughout the 2019 season, tickets to our Winn-Dixie Party Deck will be sold to individual fans featuring a 90-minute all-you-can-eat buffet! Enjoy hamburgers, hot dogs, popcorn, and tasty treats from local restaurants for just $24! Let our hospitality staff craft the perfect event for your group! Every area of Blue Wahoos Stadium is available for special events including the field, seating bowl, lounges, offices, and clubs, allowing groups big and small to enjoy unforgettable experiences! Want More Info On Groups?